Heba is a lecturer in Innovation, Enterprise and Entrepreneurship in the Business and Enterprise Division. Having taught in other Universities in the U.K., Qatar and Egypt, she has extensive experience in developing teaching portfolios at undergraduate and postgraduate levels. Additionally, she is experienced in the validation and quality assurance of Higher Education International collaborations as well as student mentorship. After achieving a first class honours degree in Business Administration with Distinction, and M.Sc. from Faculty of Commerce, Alexandria University (Egypt), Heba was awarded a studentship from the Oxford Brookes University to complete her PhD studies. She completed a Doctoral Degree in International Business and Entrepreneurship in 2018. 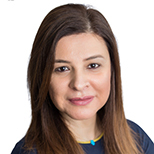 As a lecturer, Heba specialises in the delivery of enterprise and entrepreneurial management modules and relies on the use of simulation in the modules she teaches. She is also engaged in the design and delivery of the European Research Development Fund project: Enterprise Educator Training modules. Heba has been extensively engaged with the development and management of the Business Solution Centre at LSBU, which is a student-led service providing consultancy services to SMEs in the Southwark community. The Centre’s efforts have been recognised by the Institute of Enterprise and Entrepreneurs (IoEE) and the Centre was awarded the Enterprise Learning Provider of the Year (May, 2018) and featured as a case study in the Enterprise Educators UK (EEUK) report, released in November 2018. The enterprise activities undertaken by Heba and her colleagues in other schools and departments contributed to the University being awarded the University of the Year for Graduate Employment. Heba’s research focuses on SMEs internationalisation strategies and gender entrepreneurship. With a background in financial management and international business, she combines qualitative and quantitative research to examine decision-making within the context of SME internationalisation with a primary focus on emerging and under-developed economies. Heba’s research has been presented in internationally recognised conferences such as Academy of International Business (AIB) and the European Group of Organisation Studies (EGOS). Her research on female entrepreneurship in emerging economies was shortlisted for the Emerald Best International Symposium Award at the gender mainstreaming and governance during the Academy of Management Conference in 2015. Heba is also a guest editor for the Administrative Science Quarterly of Canada (ASAC). Heba has extensive experience in developing teaching portfolios at undergraduate and postgraduate levels. Additionally, she is experienced in the validation and quality assurance of Higher Education International collaborations, as well as student mentorship. As a lecturer, Heba specialises in the delivery of enterprise and entrepreneurial management modules, and her teaching pedagogy anchors on extensive use of applied learning such as the use of simulation, live business cases, guest lectures by professional bodies. Heba is also the Business School lead for the design and delivery of the European Research Development Fund project: Enterprise Educators Training Modules. Heba research focuses on SMEs internationalisation strategies and gender entrepreneurship. With a background in financial management and international business, she combines qualitative and quantitative research to examine decision-making within the context of SME internationalisation. Heba's research has been presented in internationally recognised conferences such as Academy of International Business (AIB) and the European Group of Organisation Studies (EGOS) . Her research on female entrepreneurship in emerging economies was shortlisted for the Emerald Best International Symposium Award at the gender mainstreaming and governance during the Academy of Management Conference in 2015. Ben Ayed, O., Younis, H. S., (8 March 2016). International Conference on Industrial Engineering and Operations Management, "Redesigning the Schedule Time Slots for Qatar University to Cope with Local Specificities," Other, Kuala Lumpur, Malaysia. Ben Ayed, O., Younis, H. S., Informs Annual Meeting, Philadelphia, (1–4 November 2015). "Devising a New Class Meeting Pattern for Qatar University Coping with Local Specificities," Philadelphia, United States. Younis, H. S., Katsioloudes, M., Academy of Management Conference, (Aug. 2015). "Female Entrepreneurship in Qatar: Enhancing Policy to Support Business?" Vancouver, Canada. Younis, H. European Group of Organizational Studies (EGOS) 31st. Colloquium. Sub theme 38: Internationalization of SMEs: Actors, Processes and Practices (3 July 2015). “The Internationalization Decision of the Endowed SME” ‏Athens, Greece. Younis, H. S. Oxford Brookes University Annual Doctoral Event (14 June 2015). “How SMEs from munificent business environments internationalize?” Oxford, United Kingdom. Younis, H., Katsioloudes, M. Maastricht Entrepreneurship Conference, (May 2014). "Female Entrepreneurs in Qatar – Motivations, Challenges, and Way Forward," Maastricht School of Business, Netherlands. Ben Ayed, O. Aouni, B., Younis, H. Administrative Sciences Association of Canada (ASAC), (9 – 13 May 2014). Muskoka, Canada. "Quality Function Deployment to Design Business Curriculum: An Application to King Saud University. Muskoka, Canada.